At a point approximately three miles north of Pensacola, in Mayes County, Oklahoma, the old Texas Road fords Cabin Creek. Used by the U.S. Army to supply Fort Gibson, Indian Territory, during the Civil War, the road was also utilized by Confederate forces. Along with numerous skirmishes, Union and Confederate armies twice battled at the Cabin Creek site. The First Battle of Cabin Creek occurred July 1 and 2, 1863. A Confederate force under Col. Stand Watie failed to capture a Federal wagon train on the Texas Road en route from Kansas to Fort Gibson. The Confederates formed their battle line about a mile on either side of the Cabin Creek ford. They opposed Col. James M. Williams, commanding the Union troops guarding the wagons. His force consisted of detachments from the Second Colorado Infantry, Third Wisconsin Cavalry, Sixth and Ninth Kansas Cavalry, Third Indian Home Guard, and First Kansas Colored Infantry. Facing a rain-swollen Cabin Creek, Williams decided to wait until the morning of July 2 to attack the entrenched Confederates. Placing his cannons on a ridge, Williams ordered an artillery barrage followed by an infantry assault and two cavalry charges across the creek. After hard fighting, the Confederates fled, and the wagon train continued to Fort Gibson. At this engagement the men of the First Kansas Colored Infantry held the distinction of being the first African American soldiers to fight alongside white troops. Soon after, the Union army constructed stations along the Texas Road, with one established near the Cabin Creek ford. The Second Battle of Cabin Creek was fought on September 19, 1864. 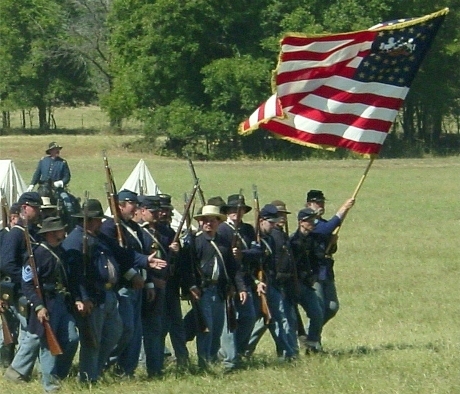 A Confederate force commanded by Brig. Gen. Richard M. Gano and Brig. Gen. Stand Watie captured a supply train of three hundred wagons under Maj. Henry M. Hopkins of the Second Kansas Cavalry. Gano and Watie surprised the Federal troops by attacking at night. Rebel artillery opened fire on the Federal defenders from close range. Around the Cabin Creek stockade the Confederates formed a battle line consisting of the Twenty-ninth, Thirtieth, and Thirty-first Texas Cavalry, the First and Second Cherokee regiments, the First and Second Creek regiments, and the Seminole Battalion. By nine o'clock the morning of September 19, the Confederates controlled the field. One hundred thirty salvaged wagons and 740 mules were put in line for the trip south. At Pryor's Creek the Confederate column was attacked by Col. James M. Williams's Second Brigade, which was marching from Fort Gibson to relieve the besieged train. Fooling the Federal commander into thinking the train was being parked for the evening, at nightfall Gano ordered his men to light campfires and repeatedly drive an empty wagon across rocky ground. Then, under the cover of darkness, Gano rolled the wagons to the northwest and escaped with captured supplies valued at an estimated $1.5 million. Although not a strategic victory, the Second Battle of Cabin Creek was the last major battle of the Civil War in Indian Territory. It raised morale among the Confederates and allowed Watie to campaign until June 23, 1865, making him the last Confederate general to surrender. The Cabin Creek Battlefield was placed on the National Register of Historic Places in 1971 (NR 71000669). Wiley Britton, The Civil War on the Border, Vol. 2 (3d ed., rev. ; Ottawa: Kansas Heritage Press, 1994). 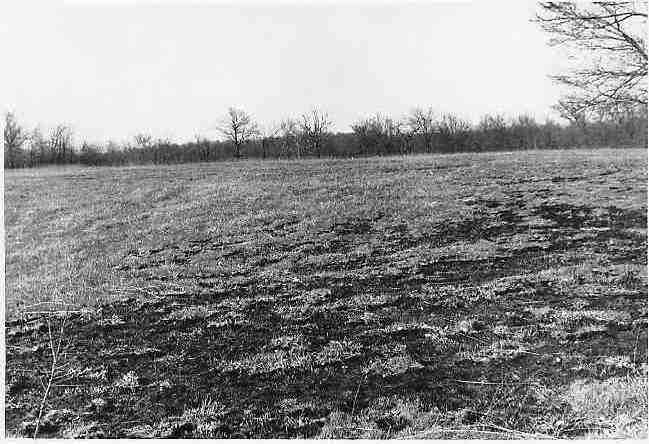 Marvin J. Hancock, "The Second Battle of Cabin Creek, 1864," The Chronicles of Oklahoma 39 (Winter 1961–62). Steven L. Warren, Brilliant Victory: The Second Civil War Battle of Cabin Creek, Indian Territory, September 10, 1864 (Wyandotte, Okla.: Gregath Publishing, 2002). Steven L. Warren, "Cabin Creek, Battles of," The Encyclopedia of Oklahoma History and Culture, https://www.okhistory.org/publications/enc/entry.php?entry=CA001.